Middle East : LinkedIn, the world’s largest professional network, has unveiled new research providing insight into the UAE economy. The research shows that the UAE is becoming a thriving hub for business and industry. The findings of the research are aligned with the UAE government’s vision which aims to further aid the country’s economic development in industries and infrastructure. The data that shows that almost 60% of the UAE’s workforce is currently employed by local companies. The latest statistic is demonstrative of the investment local companies are making in the youth of the UAE and shows how some sectors such as banking, aviation, telecommunications, hospitality and retail are staunchly supporting young UAE talent. The research shows that Emirati companies come up on top in terms of supporting the local labour force despite hundreds of international companies being regionally headquartered in the UAE. The research is part of LinkedIn Economic Graph, a digital mapping of the global economy. Currently developing the first Economic Graph in the world, LinkedIn’s vision is to create an economic opportunity for every member of the global workforce. The graph includes every job opportunity in the world; the skills required to obtain those opportunities; the profiles for every company in the world offering those opportunities; the professional profiles for every one of the 3.3 billion people in the global workforce; and the professional knowledge that exists within and between each of these entities. The UAE Economic Graph has been built on the data of the country’s 3 million registered users of professionals. The findings were released today at LinkedIn’s Dubai headquarters in partnership and the presence of Dr. Ahmad Belhoul, ýMinister of State for Higher Education Affairs and H.E. Dr. Aisha Bin Bishr, Director General of the Smart Dubai Office. LinkedIn’s collaboration with the Ministry of Education aims to equip students with the information they need to learn the skills of the future. The findings from the Economic Graph will aid students in deciding which qualifications they need in order to make them more employable. The data reveals that Civil Engineering, Business Management and Computer Science are the leading degrees for undergraduates in the UAE whilst Industrial Engineering, Business Management and Computer Science took the top spots for postgraduate students in the UAE. In nearly every industry tech skills are becoming a requirement. LinkedIn recently unveiled the UAE’s Top Skills of 2016, the skills that are most sought after among employers in the UAE. Six of the top ten skills listed were in the tech industry with Statistical Analysis and Data Mining coming up number one. The research has also mapped the primary skill clusters for the future of innovation in the UAE. Robotics, Data Science, 3D printing and the Internet of Things are the core skills which the World Economic Forum classes as the main physical and digital drivers of the fourth industrial revolution. These skills are highly sought after in the UAE and big data certification adds an edge to job applicants’ profiles. Currently, UAE is number 16 globally in having the highest number of 3D printing & design talent. Over 60% of 3D talent professionals work for local UAE companies. “I commend LinkedIn on the launch of its Economic Graph initiative in the UAE, which will help university graduates better understand professional opportunities available in the country and globally,” noted HE Dr. Ahmad Belhoul, Minister of State for Higher Education Affairs. “Furthermore, the Economic Graph will be integral to shaping the higher education landscape in the UAE to ensure that our students are graduating with the skills they need for the jobs of the future,” he added. “Our private sector collaborations with companies such as LinkedIn are vital in helping us to achieve our strategic pillars and contribute to Smart Economy. This innovative in-depth analysis of data aligns with our purpose of maximizing happiness for individuals in Dubai. By better understanding the UAE economy and pool of talent, we can work together to empower our residents. Smart Dubai prides itself on identifying global best practices and we recognize the work that LinkedIn is doing around the world through Economic Graph. We are happy that the UAE is the first regional market to launch Economic Graph and we look forward to using the data to maximize happiness in the UAE,” said Her Excellency Dr. Aisha Bin Bishr Director General of the Smart Dubai Office. 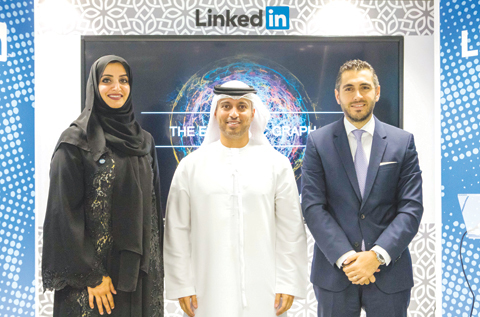 “Launching the UAE Economic Graph has been a momentous step for LinkedIn. We are deeply committed to our vision of creating an economic opportunity for every member of the global workforce and through our strategic partnership with the Ministry of Education and Smart Dubai Government, we are one step closer to realizing these goals in the UAE. The UAE Economic Graph represents the first Economic Graph to be launched in the Middle East and we plan on rolling out the digital map across the region. The findings from the UAE Economic Graph are positive indicators of local economic development and the confidence that UAE citizens have in the UAE as a hub for industry and business” said Ali Matar, Head of LinkedIn Talent Solutions, Growth Markets, Southern Europe, Middle East and North Africa. Findings from the UAE Economic Graph show that 58% of the UAE-based workforce is now employed by established local companies, SME’s and start-ups. The remainder of the UAE-based workforce is employed by companies based in the US, India and Europe. When it comes to finding local employment, the majority of graduates prefer to work for companies in the UAE. 75% of those who studied at UAE universities have chosen to remain in the UAE and have shown great interest in contributing and developing the local community. Conversely, the employment sector that employs the most people in the UAE is Professional Services (16%). Architecture & Engineering (14%), Financial Services (10%), Retail & Insurance (10%), Aero/Auto/Transport (8%) and Oil & Energy (8%) also dominate the list.